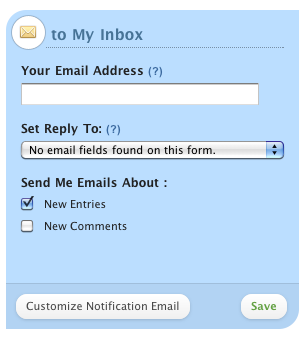 Set up email notifications when someone submits your form (new entries) or when a user in your Wufoo account adds a comment to an entry (new comments). TIP! Watch our video overview. Enter your email address. Separate multiple email addresses with a comma. Choose the Reply To email. Select if you'd like emails when you get New Entries, New Comments, or both. TIP! You can also set up confirmation emails so people who fill our your form can get a copy of their entry. The Reply To email is where replies to notification emails are sent to. By default, email notifications are set to No Reply To. This means if you reply to a notification email, it'll go to no-reply@wufoo.com and bounce back to you. If you have an Email field in your form, you can change the Reply To to that field—this means if you reply to a notification email, it goes to the email address entered by the person who filled out your form so you can follow up with people directly. You can also add a cc by customizing your email so replies can go to the cc. Editing the Reply To doesn't change the From email address—notification emails always come from no-reply@wufoo.com. It's only possible to customize the from name and subject line. At the bottom of the My Inbox box, click Customize Notification Email. Enter Your Name or Company. This is the text that shows as the from name in the email, but the from email is always no-reply@wufoo.com. Add cc's or bcc's, if ya want. Enter the Message Subject. The defaults is your form title and the entry ID, like Pizza Palace Order Form [#13], but you can customize this however you'd like. TIP! You can use templating to pull field data from your form into the subject line of your email notification. First you’ll want to check your spam or junk folders just in case. Notification emails are sent from no-reply@wufoo.com, so whitelisting that address and adding it to your safe senders list should help prevent it from going to spam or junk. We also recommend trying a different email address (with a different domain if possible) to see if the problem is isolated to that particular email address or domain.